We hope that your experience at the Center for Sleep Medicine will be a pleasant one. Understanding the sleep process and sleep disorders will help you take an active role in your care. What do I need to do for the overnight sleep study? • Avoid caffeine, alcohol, or napping the day of the test. • Bring comfortable clothing to sleep in. You may also bring a pillow, if you’d like. • Eat your normal dinner before you come in. • Shower and wash your hair. Do not put oils/lotions on your skin. Do not use hair products. • Bring any medications you may need to take before bedtime. • You may bring a snack. Yes, unless specifically instructed by your physician, take your medication as usual. Also, bring any medication you will need during the night or early in the morning. The Sleep Center does not provide medication or snacks. It is important for the Sleep Professionals to know what medications you are taking since many medications can affect sleep. After you are checked into the lab, a technician will greet you and show you to your room. The technician will explain the set-up procedure and answer any questions you may have. You should also inform the technician of any changes in your sleep or specific difficulties that you have not already discussed with your healthcare professional. You will be given time to change into your nightclothes and get ready for bed. There may be a waiting period while the technician applies the electrodes. You may read, watch TV, or relax during this time. If you have a commitment in the morning, be sure to inform the technician so they will be able to make sure you are out early enough in the morning. Otherwise, you can expect to be discharged between 6:00 – 6:30 in the morning. What should I expect during the sleep study? We use the latest technology namely SOMNOcheck micro on our patients to conduct sleep studies. This is worn like a wristwatch. 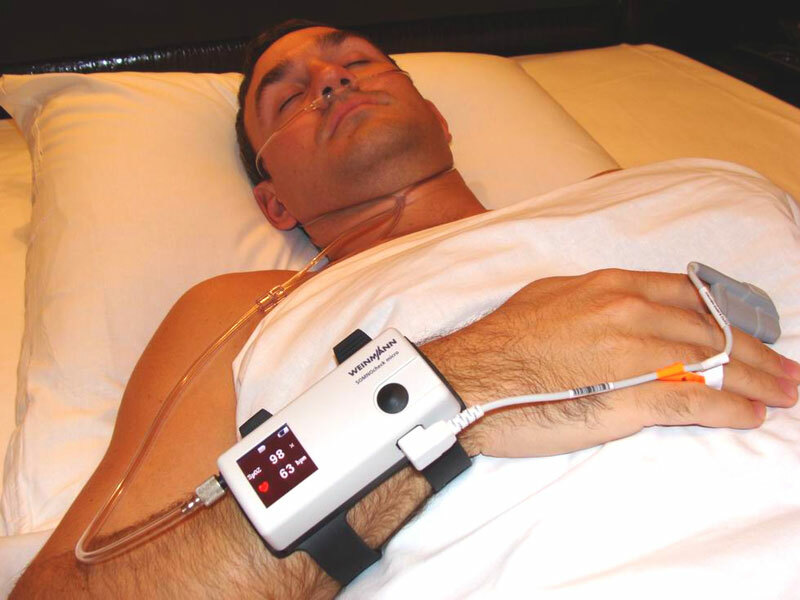 The screening device is so comfortable that it doesn‘t disturb the patient‘s sleep and so easy to use that the patient can manage it on his own. Other than the screening device there is only a nasal canella attached to the nose and a oxygen sensor placed on the patients finger. (see images below) After your study we will transfer the data via a USB interface to the PC, and a full summary report will be printed for doctor to analyze. A follow up consultation is necessary for Doctor to discuss the results and treatment with the patient. You will have a follow-up visit with your healthcare provider or a Sleep Specialist to discuss the results of your study. It is preferred that you wait until the sleep study results are available before the follow-up appointment is scheduled. Sleep study results are not generally discussed over the telephone because of their complex nature. To fully understand the results of your sleep study, their implications, and treatment options, you should meet face-to-face with a healthcare professional. Can I leave my car at the sleep center overnight? Yes, parking is available in the visitors lot.